Microsoft’s Surface Pro series has now had four chances to iron out all the wrinkles in its ambitious tablet/laptop hybrid. Although its still striving to be an all-around laptop killer, it seems Microsoft got one thing very right with the new Pro 4—it has one of the most accurate displays ever created. The key element for a great tablet has always been a truly innovative and top performing display, and the best leading edge tablets have always flaunted them. With the latest fourth generation Surface Pro 4, Microsoft has produced another excellent professional grade high performance display for Windows that breaks a number of LCD tablet performance records. In fact, based on our extensive lab tests and measurements, the Surface Pro 4 has one of the very best and most accurate displays available on any mobile platform and OS. It joins near the top of a small set of excellent tablets displays – for professionals that need a very accurate and high performance display for their work, and for consumers that want and appreciate a really nice and beautiful screen. The display on the Surface Pro 4 is actually a major upgrade and enhancement to the already excellent display on the Surface Pro 3, with significantly higher screen resolution (2736x1824 to 2160x1440), 24 percent higher pixels-per-inch (267 to 216 ppi), and 60 percent more total pixels (5.0 to 3.1 million). In addition, every display performance metric has been improved over the already excellent Surface Pro 3, including the display’s maximum brightness, contrast ratio, absolute color accuracy, viewing angle performance, and with lower screen reflectance, resulting in much better performance in ambient light. We’ll cover these issues and much more, with in-depth comprehensive display tests, measurements, and analysis that you will find nowhere else. Microsoft provided DisplayMate Technologies with a production unit of the Surface Pro 4 so that we could perform our well known objective and comprehensive display lab tests, measurements, and analysis, explaining the in-depth display performance results for consumers, reviewers, and journalists. To examine the performance of the Microsoft Surface Pro 4 display, we ran our in-depth series of Mobile Display Technology Shoot-Out Lab tests and measurements in order to determine how it performs compared to other leading Tablets. We take display quality very seriously and provide in-depth objective analysis based on detailed laboratory tests and measurements and extensive viewing tests with both test patterns, test images and test photos. To see how far LCD and OLED mobile displays have progressed in just five years see our 2010 Smartphone Display Shoot-Out, and for a real history lesson see our original 2006 Smartphone Display Shoot-Out. The Surface Pro 4 is designed to perform both as a large tablet and a small laptop with its detachable keyboard. With a 12.3 inch screen diagonal it is considerably larger than most tablets, with a screen area that is 54% larger than the Apple iPad Air 2, and 40% larger than the Samsung Galaxy Tab S 10.5, but 13% smaller than the iPad Pro. With its adjustable kickstand, the angle of the display can be adjusted in the same way as a laptop, an important viewing and working advantage. The Screen’s 3:2 (1.50) aspect ratio is an excellent compromise between the 4:3 (1.33) Aspect Ratio for most documents (the same as 8.5x11 inch paper with 0.5 inch borders, and also the iPad’s 4:3 (1.33) Aspect Ratio) and 16:9 (1.78) aspect ratio for widescreen video content (and similar to Android tablets that have a 16:10 (1.60) aspect ratio). The display’s 2736x1824 pixel resolution has 5.0 megapixels, 2.4 times the number of pixels on an HDTV, but on a 12.3 inch screen. The screen’s 267 pixels per inch (ppi) is excellent for a full-size tablet, a trifle higher than the 264 ppi for the Apple iPad Air 2 and iPad Pro (so the Surface Pro 4 is what Apple classifies as a Retina Display), but slightly lower than the record high 287 ppi for the Samsung Galaxy Tab S 10.5-inch tablet. The larger the screen the further away its typical viewing distance. The Surface Pro 4 pixels are not resolved with normal 20/20 vision at viewing distances of 13 inches or more, so the display appears perfectly sharp for typical viewing distances of 16 inches or more. In addition, the Surface Pro 4 uses sub-pixel rendering (called ClearType in Microsoft’s implementation) that significantly improves the visual sharpness of text over standard pixel rendering that is used in most mobile displays. For black and white and gray images with sub-pixel rendering, there is up to a factor of 3 improvement in image sharpness. The Surface Pro 4 has the most accurate on-screen colors of any tablet display that we have ever measured for the sRGB/Rec.709 standard that is used for virtually all current consumer content for digital cameras, HDTVs, the internet, and computers, including photos, videos, and movies. The color gamut is 102 percent, very close to the standard gamut as shown in this figure. The average absolute color accuracy over the entire color gamut is an excellent 1.9 JNCD, which is typically visually indistinguishable from perfect. It is the most color accurate display that we have ever measured for a tablet. The maximum color error of 4.1 JNCD is larger, but it is centered on blue, which is less visually important as explained in this article. See this figure for an explanation and visual definition of JNCD and the color accuracy figures showing the measured color errors. See the color accuracy section, the color gamut figure, and the color accuracy figures for measurements and details. Producing high absolute color accuracy is incredibly difficult because everything on the display has to be done just right. In addition, Microsoft itself individually calibrates every Surface Pro 4 display on the production line to optimize the color gamut and white point. Color accuracy is especially important for professional imaging applications when you must be sure of the on-screen image colors, when viewing photos from family and friends (because you often know exactly what they actually should look like), for some TV shows, movies, and sporting events with image content and colors that you are familiar with, and also for viewing online merchandise, so you have a very good idea of exactly what colors you are buying and are less likely to return them. The Intensity Scale (sometimes called the Gray Scale) not only controls the contrast within all displayed images but it also controls how the red, green and blue primary colors mix to produce all of the on-screen colors. So if the Intensity Scale doesn’t follow the standard that is used to produce virtually all consumer content then the colors and intensities will be wrong everywhere in all images. Unfortunately, many manufacturers are quite sloppy with the Intensity Scale on their displays (because it is logarithmic and not linear). Fortunately, the Intensity Scale on the Surface Pro 4 is a close match to the sRGB/Rec.709 standard – very smooth and (logarithmically) straight, but slightly less steep with a slope gamma of 2.13 compared to the standard 2.20. See figure 3 for a plot of the measured Intensity Scale and the Colors and Intensities section for measurements and details. The Surface Pro 4 has a measured peak brightness of 436 cd/m2 (nits), which is very good, and among the highest for full size tablets that are 9 inches or larger, but still lower than many smartphones and smaller tablets. High screen brightness is only needed when in high ambient light, but since the Surface Pro 4 is larger, it is less likely to be opened outdoors in unshielded high ambient light environments like smartphones and smaller tablets, so its peak brightness should not be an issue for most users and applications. See the Brightness and Contrast section for measurements and details. The display’s Maximum Contrast is the ratio between its peak white brightness (Luminance) and its darkest black luminance, one of the more important measures of LCD performance quality. We measured the black luminance at 0.31 nits, giving the Surface Pro 4 a true contrast ratio of 1406, higher than Microsoft’s own specification of 1300, and among the highest we have ever measured for a mobile LCD display. Note that some manufacturers list a much higher (dynamic) contrast ratio for their LCDs, but that is just meaningless marketing puffery. The Contrast Ratio changes with viewing angle, and the Surface Pro 4 has the highest we have ever measured for an LCD tablet (see below). Displays are seldom used in absolute darkness, so their screen reflectance and performance in ambient lighting is very important. For the Surface Pro 4, it is not as critical as with smartphones and smaller tablets because its larger 12.3 inch screen is less likely to be opened outdoors in unshielded high ambient light environments. The adjustable kickstand is particularly useful for adjusting the display angle in order to minimize reflections. The Surface Pro 4 has a Gorilla Glass 4 cover that is optically bonded to the PixelSense Pen and Touch Interface and the LCD panel without any air gaps. The measured Screen Reflectance for the Surface Pro 4 is 5.6 percent, which is very good and lower than most other tablets and smartphones, but also much higher than the iPad Air 2, which has an anti-reflection coating that provides 2.5 percent reflectance. The display’s Contrast Rating for high ambient light measures the screen’s readability in ambient light and depends on both the screen reflectance and maximum brightness. For the Surface Pro 4 it is 78, which is very good and 24 percent higher than the Surface Pro 3, and better than most full-size tablets, but also much lower than the 166 for iPad Air 2 with its low reflectance coating. However, the adjustable kickstand for the Surface Pro 4 can be used to reduce reflections, and its larger 12.3 inch screen is less likely to be opened outdoors in unshielded high ambient light environments. See the Screen Reflections and Brightness and Contrast sections for measurements and more details. While tablets are primarily single viewer devices, the variation in display performance with viewing angle is still very important because single viewers frequently hold the display at a variety of viewing angles, plus they are large enough for sharing the screen with others. One important advantage of the Surface Pro 4 is its adjustable kickstand, which makes it possible to adjust the viewing angle of the display in the same way as a laptop. That is not only convenient but also reduces any viewing angle effects. The Surface Pro 4 has a high performance IPS / PLS LCD display, so we expected it to show very small color shifts with viewing angle, and our lab measurements confirmed its excellent viewing angle performance, with no visually noticeable color shifts. The contrast ratio also changes with viewing angle, and at 30 degrees the Surface Pro 4 contrast ratio is 809 in landscape mode and 865 in portrait mode, the highest we have ever measured for an LCD tablet. However, all LCDs, do have a strong decrease in brightness (luminance) with wiewing angle, and the Surface Pro 4 showed (as expected) slightly more than a 50 percent decrease in rightness at a modest 30 degree viewing angle. See the Viewing Angles section for measurements and details. 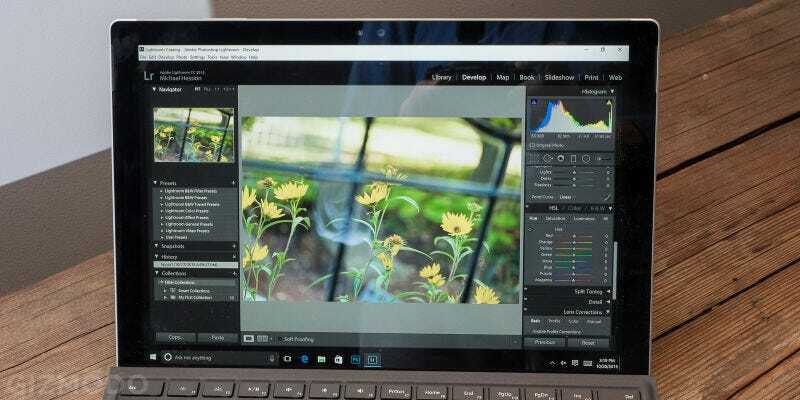 With its accurate Intensity Scale and high color accuracy the Surface Pro 4 provides very nice, pleasing, and accurate image colors and picture quality. The very challenging set of DisplayMate Test and Calibration Photos that we use to evaluate picture quality looked beautiful, even to my experienced hyper-critical eyes. However, viewers that instead like vivid or exaggerated colors and image contrast may find the accurate Surface Pro 4 images to appear somewhat subdued. While the Surface Pro 4 display is considerably larger in area than the other top tier tablets and would normally be expected to require considerably more power, its display is more power efficient and it actually uses less power than many smaller tablets (including the iPad Air 2). The Surface Pro 4 has a Display Power Efficiency comparable to the Surface Pro 3, but considerably better than the iPad Air 2. On the other hand, the higher pixels-per-inch lowers the display power efficiency because at higher densities the LCD backplane circuitry proportionally blocks more of the backlight. However, the IGZO Metal Oxide backplane in the Surface Pro 4 reduces this effect and increases the light output improving its power efficiency. See the Display Power section for measurements and details. The primary goal of this Display Technology Shoot-Out article series has always been to publicize and promote display excellence so that consumers, journalists and even manufacturers are aware of and appreciate the very best in displays and display technology. We point out which manufactures and display technologies are leading and advancing the state-of-the-art for displays by performing comprehensive and objective scientific lab tests and measurements together with in-depth analysis. We point out who is leading, who is behind, who is improving, and sometimes (unfortunately) who is back pedaling…all based solely on the extensive objective careful lab measurements that we also publish, so that everyone can judge the data for themselves as well. Based on our extensive lab tests and measurements on the display for the Surface Pro 4, Microsoft has produced an excellent professional grade high performance display for Windows that breaks a number of LCD tablet performance records. In fact, the Surface Pro 4 has one of the very best and most accurate displays available on any mobile platform and OS. It joins near the top of a small set of tablets that have excellent top tier displays – ideal for professionals that need a very accurate high performance display for their work, and for consumers that want and appreciate a really nice and beautiful display. In addition, what is particularly significant and impressive is that Microsoft has systematically improved every display performance metric over the already excellent Surface Pro 3, including the display’s maximum brightness, contrast ratio, absolute color accuracy, viewing angle performance, and with lower screen reflectance, resulting in much better performance in ambient light. The Surface Pro 4 delivers uniformly consistent all around top tier display performance: it is only one of a few displays to ever to get all green (very good to excellent) ratings in all test and measurement categories (except for brightness variation with viewing angle, which is the case for all LCDs) since we started the Display Technology Shoot-Out article series in 2006, an impressive achievement for a display. See the Shoot-Out Comparison Table for the detailed test and measurement results. The Surface Pro 4 also has the most accurate on-screen colors of any tablet display that we have ever measured for the sRGB/Rec.709 standard that is used for virtually all current consumer content for digital cameras, HDTVs, the internet, and computers, including photos, videos, and movies. That is another impressive achievement because everything in the display has to perform just right in order to produce very accurate colors – it is the single most challenging and important performance characteristic for a display. The Average Absolute Color Accuracy for the Surface Pro 4 is an Excellent 1.9 JNCD, which is typically visually indistinguishable from perfect. It is the most color accurate display that we have ever measured for a tablet. The maximum color error of 4.1 JNCD is larger, but it is centered on blue, which is less visually important as explained in this article. See the Color Accuracy section and Color Accuracy Figures for measurements and details. Color accuracy is especially important for professional imaging applications when you must be sure of the on-screen image colors, when viewing photos from family and friends (because you often know exactly what they actually should look like), for some TV shows, movies, and sporting events with image content and colors that you are familiar with, and also for viewing online merchandise, so you have a very good idea of exactly what colors you are buying and are less likely to return them. There are many other applications that require or would benefit from much better absolute color accuracy, such as in sales and marketing presentations, and especially in medical imaging, where it can improve diagnostic accuracy for doctors, hospitals and patients. For digital photography, the Surface Pro 4 is an excellent large mobile display that has much better picture quality and color accuracy than the camera’s own display, for reviewing your photos as you are taking them or for showing them off. Dr. Raymond Soneira is President of DisplayMate Technologies Corporation of Amherst, New Hampshire, which produces display calibration, evaluation, and diagnostic products for consumers, technicians, and manufacturers. See www.displaymate.com. He is a research scientist with a career that spans physics, computer science, and television system design. Dr. Soneira obtained his Ph.D. in Theoretical Physics from Princeton University, spent 5 years as a Long-Term Member of the world famous Institute for Advanced Study in Princeton, another 5 years as a Principal Investigator in the Computer Systems Research Laboratory at AT&T Bell Laboratories, and has also designed, tested, and installed color television broadcast equipment for the CBS Television Network Engineering and Development Department. He has authored over 35 research articles in scientific journals in physics and computer science, including Scientific American. If you have any comments or questions about the article, you can contact him atdtso.info@displaymate.com. DisplayMate Technologies specializes in proprietary advanced scientific display calibration and mathematical display optimization to deliver unsurpassed objective performance, picture quality and accuracy for all types of displays including video and computer monitors, projectors, HDTVs, mobile displays such as Smartphones and Tablets, and all display technologies including LCD, OLED, 3D, LED, LCoS, Plasma, DLP and CRT. This article is a lite version of our intensive scientific analysis of Smartphone and Tablet mobile displays – before the benefits of our advanced mathematicalDisplayMate Display Optimization Technology, which can correct or improve many of the display deficiencies. We offer DisplayMate display calibration software for consumers and advanced DisplayMate display diagnostic and calibration software for technicians and test labs.